Initially subtitled An Illustrated Quarterly of the Arts and Crafts, and later The International Quarterly of Arts and Crafts, Craftwork was published in 7 volumes (28 issues). It was edited by Herbert Wauthier (1924-28); D.S. McColl (1929-30); and Randolf Schwabe (1930-1931). The journal was a critical review of contemporary fine, decorative and applied art. It contains articles on wall decoration, sculpture, poster art, hand printing, photography, scenography, wood engraving, woodcuts, furniture design, batik, industrial design, stained glass, etching, medal design, architectural drawing, advertising art, ceramics, lithography, silversmithing, glass art, prints, illustration, architecture, documentary films, textile design, etc. 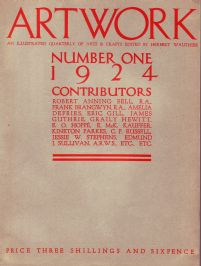 Contributors to Artwork included, James Laver, John Grierson, R.H. Wilenski, John Rothenstein, Douglas Percy Bliss, Martin Hardie, Sir Reginald Blomfield, Henry Tonks, John Gloag, E.O. Hoppé, Bernard Rackham, Jacob Epstein, Wyndham Lewis, Charles Ginner, Gordon Craig, Omar Ramsden, E. McKnight Kauffer, Edward Wadsworth, Frederick Etchells, Robert Anning Bell, Eric Gill, Gordon Russell, Paul Nash, William Rothenstein, Muirhead Bone, etc. Among artists whose work is discussed or illustrated in Artwork include C.R.Ashbee, Frank Brangwyn, Ivan Mestrovic, W.G. Raffé, Eric Gill, William Roberts, E. McKnight Kauffer, Georg Jensen, Bernard Leach, Eric Ravilious, Aristide Maillol, René Lalique, Diego Rivera, Frans Masereel, John Skeaping, Edward Bawden, Charles Rennie Mackintosh, Walter Crane, David Jones, Katherine Pleydell-Bouverie, Dora Braden, Edward Johnston, Pablo Picasso, Aubrey Beardsley, etc.